chesslim if < 0.75, all in. goodiewilly anyone can understand the rationale behind the 20 March announcement ? good chance to fly ? Dive ? hornbill just internal share ownership transfer..right hand to right hand. Newplayer286 Everyday drop so will drop until 0.60? Veron_teo because the price will fly to 1.8 if the japanese bought from open market which the boss dont want it to happen. goodiewilly con man counter..owners sold at 1.40 for multiple millions shares whereas ikan bilis at the market at 83 cents, Bursa never bother. goodiewilly they can collect back slowly from the market from 83 cents..all the ways back to 110 and yet still make millions and millions....con man. Newplayer286 This counter ni no ni no...ambulance needed. 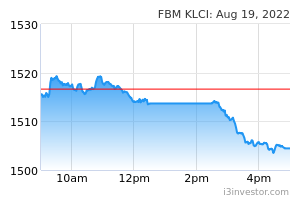 hornbill Should have support at 80sen after company announced share buy back. Newplayer286 If share buy back when they sell off is there any notification? Speed123 goodiewilly cut lose jor lo.. after cny..
but now seem like bottom line. i hope la..
陈田丰 How u know? Insideer tips? Speed123 this MB things i heard since before CNY. Newinvest_112 Bad counter. The daily movement is always downward. Waste time playing this counter unless want to hold super long term 10yrs?